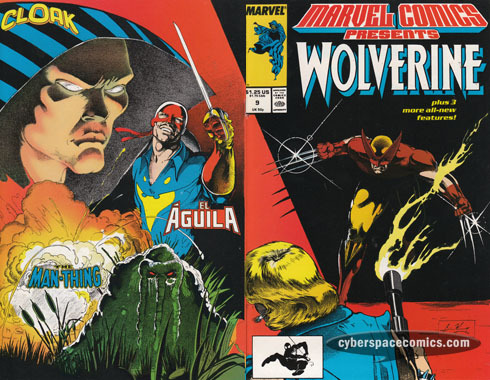 In this penultimate chapter, Wolverine and Razorfist battle to the death! (Death? heh heh … this is comics, people – so you can be assured that Razorfist eventually pops up alive somewhere.) And, while that’s going on, the Tyger (Jessan Hoan) takes on the Inquisitor and Sapphire Styx. Next up? Roche! The raid on the cultist base in Florida continues and the Man-Thing takes a missile – right to the chest! And now, all that’s left is his head. In Northern California, the mutated Senator Wycombe (who I guess we’re now calling Railsback) is raging against the prison he’s in. And, finally, Colonel Jody Choate prepares to be injected with the same defective Super Soldier Serum that has infected Wycombe. Cloak volunteers to save a girl that’s fallen down a well. But, when he gets there, he discovers she’s surrounded by the Molemen! He immediately attacks them only to later learn that they were trying to help her, as well. Moments later, a flash flood threatens to kill them all but Cloak envelopes them all and transports them to safety. The experience leaves him with a lot to ponder about what makes a “monster”. El Aguila returns to his home village in Spain to free it from the evil influence of el Conquistador. But, he quickly discovers that he’s outmatched in brute strength. He’ll have to utilize his intellect and bio-blast powers to free his town. The two single-issue features included here are a great representation of how they can be done right … and wrong. El Aguila’s story is all action-oriented and does little else but spotlight a lesser-exposed Marvel hero. Cloak’s story, on the other hand, is all about creating a character moment – allowing for character (and reader) introspection. Actually, the cover to this issue is by Brian Murray, who did some work on DC’s Young All-Stars, and a few Image gigs, before leaving comics. good catch! I’ve updated it. Thanks!